Virginians are incredibly fortunate to live in a state resplendent in natural beauty. From our beaches, bay and ocean in the east, to the mountains, trails, rivers, and valleys in the west and everywhere in between, Virginia is a haven for those who love the outdoors from both within and outside the Commonwealth. As governor, Ed will advocate for outdoor recreation in Virginia as a viable growth industry, including the many benefits associated with recreating in the Commonwealth’s outdoor spaces. Virginia’s diverse outdoor recreational activities include camping, hiking, hunting, fishing, cycling, trail riding, kayaking and wildlife viewing. Our abundant landscapes, plentiful waterways and varied terrain and topography are ideal locations for residents and visitors to have unforgettable experiences. These experiences contribute to the quality of life and the economic vitality of the Commonwealth. Outdoor recreation is a significant economic driver in Virginia, with the potential for significant growth. The Outdoor Industry Association’s 2017 Economic Development Report states that outdoor recreation in Virginia creates $21.9 billion in annual consumer spending, and is directly responsible for 197,000 jobs and $6.5 billion in wages and salaries. This industry generates $1.2 billion in state and local revenue in Virginia. Ed Gillespie knows we can do even better, considering that in our neighboring state of North Carolina, outdoor recreation generates $28.0 billion in annual consumer spending, creates and sustains 260,000 jobs and $8.3 billion in wages and salaries and generates $1.3 billion in state and local revenue. In addition to the economic benefits, spending time outdoors is good for one’s overall well-being. Promoting outdoor recreation with youth often sets the stage for lifelong enjoyment and respect for the outdoors. Outdoor recreation further provides an excellent opportunity for environmental education. Residents and visitors who spend time in the outdoors have a much greater appreciation of nature and natural resources, inspiring them to be better stewards of our outdoor spaces. To advance Virginia’s outdoor recreation economy requires an enterprise approach, as opposed to promoting the various activities in silos. Suppose you are planning an outdoor family adventure on the East Coast of the United States. To evaluate Virginia’s opportunities, you would have to check numerous websites, consult multiple databases and you still couldn’t be sure that you have explored all of Virginia’s many outdoor options. Our state can and should be a top destination for families and individuals across the country, and we must market ourselves with that goal in mind. Convene Virginia’s first “Summit on the Summit” as an annual day for Virginians to get outside to reach the summit of their chosen mountain. Ed and Cathy will summit Bluff Mountain near Buena Vista! It is important to market Virginia in a coordinated fashion that promotes our public and private assets. Colorado launched a website – the Outdoor Recreation Information Center (ORIC.org). This site is a public-private partnership that is an easy to search catalog of outdoor recreation activities available in Colorado including those hosted by local governments (parks and trails), the Federal Government (parks, forests), state government (parks, fishing, hunting) and private sites (camping, rafting). Visitors can search by activity, area of interest and type of interest. As governor, Ed will establish TheOutdoorDominion.com modeled after Colorado’s ORIC. The site would be administered by the Virginia Tourism Corporation to display links to maps, costs and sign ups as applicable. 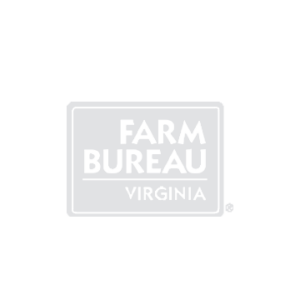 For fishing and hunting activities, the site will link to online license applications. 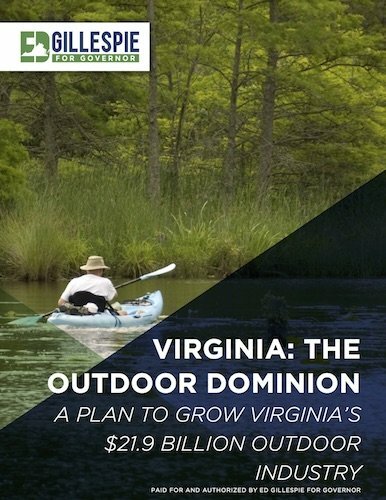 The OutdoorDominion.com will provide a comprehensive outdoor recreation website that will serve as a one-stop public information hub for outdoor recreational opportunities and resources in Virginia. Virginia is blessed to be home to many state and national parks that provide activities for Virginians and our guests. As governor, Ed will advance and open Clinch River State Park in Southwest Virginia, further advancing a major tourism and outdoor economy initiative taking root in the region. Virginians and our guests enjoy our rivers and streams and frequently request new water access points to make the experience more enjoyable. As governor, Ed will work to add 50 new river, stream and water access points on government owned lands. As governor, Ed will direct the Department of Conservation and Recreation (DCR) and the Virginia State Park System to provide a comprehensive report of our award winning state parks, including maintenance needs, recommendations for the development of new and expansion of existing programs that enhance outdoor recreation and access (including infrastructure needs such as trails, campsites, boat launches, etc. ), an assessment of developing new parks and the appropriate resources necessary to implement these objectives. This will be a focused expansion of DCR’s overall strategic report that includes state parks. This report will utilize various resources including the individual state park’s decennial master plans, DCR’s 2015 Capital Request document and Virginia Tech’s 2016 State Parks Economic Impact Study. While tourism is a large component of this industry, outdoor recreation is not exclusively a tourism economy. In addition to the many vital local retail stores, we also have national outdoor retail companies establishing a presence in Virginia. This includes Backcountry.com, the largest online outdoor retail store that built its East Coast distribution center in Montgomery County, further highlighting the logistical advantage Virginia enjoys over other states. As governor, Ed will direct the Virginia Economic Development Partnership (VEDP) to actively search for economic development opportunities related to outdoor recreation and to include consideration for this industry and its benefits for recruiting prospective employers. Ed will engage with the Virginia Outdoor Recreation Caucus, comprised of state legislators, executive branch officials and private sector stakeholders to advance eco-tourism and eco-education. Ed will issue an executive order recognizing outdoor recreation as a significant industry in Virginia. The executive order will direct the Secretary of Commerce and Trade and the Secretary of Natural Resources to convene an Outdoor Recreation Advisory Panel of relevant state officials and stakeholders for the purpose of developing a comprehensive strategy to market and support the outdoor recreation industry in Virginia. 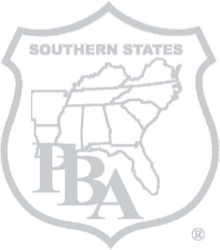 This advisory panel will utilize and provide recommendations regarding the statutorily required five-year Virginia Outdoors Plan (VOP) and other related tools, including the VOP Mapper system and the Virginia Outdoors Demand Survey.